It's not quite right to say that the Foo Fighters only have one sound, but why does it always feel like the group constantly mines the same sonic vein? Even on 2007's Echoes, Silence, Patience & Grace -- their sixth album and first with producer Gil Norton since their second, 1997's The Colour and the Shape -- the Foos feel familiar, although the group spends some palpable energy weaving together the two sides of their personality that they went out of their way to separate on 2005's In Your Honor, where they divided the set into a disc of electric rockers and a disc of acoustic introspection. Here, the Foos gently slide from side to side, easing from delicate fingerpicked folk (including "Ballad of the Beaconsfield Miners," an instrumental duet between Dave Grohl and guitarist Kaki King) to the surging, muscular hard rockers that have been the group's modern rock radio signature. Echoes never lingers too long in either camp, as it's sequenced with a savvy professionalism that only veteran rockers have. That sense of craft is evident in all the songs, whether it's the subtly sly suite of the opening "The Pretender" -- after a slow build, it crashes into a crushing riff into a chorus, building to a typically insistent chorus before taking a slightly surprising bluesy boogie detour on the bridge -- or the sweet melodic folk-rock "Summer's End," a song as warm and hazy as an August evening. "Summer's End" is one of the unassailable highlights here, and all the rest of the truly memorable tunes on Echoes share its same, strong melodic bent, particularly "Statues," a wide-open, colorful anthem that feels as if it's been resurrected from a late-'70s AOR playlist. These songs place the melody at the forefront and also have a lighter feel than the rockers, which are now suffering from a dogged sobriety. For whatever reason, Dave Grohl has chosen to funnel all of his humor out of the Foo Fighters' music and into their videos or into his myriad side projects. When Grohl wants to rock for fun, he runs off and forms a metal band like Probot, or he'll tour with Queens of the Stone Age or record with Juliette Lewis. When it comes to his own band, he plays it too straight, as almost every rocker on Echoes -- with the notable exception of "Cheer Up Boys (Your Make Up Is Running)," a song that has a riff as nimble as those on the Foos' debut -- is clenched and closed-off, sounding tight and powerful but falling far short of being invigorating. They sound a little labored, especially when compared to the almost effortlessly engaging melodies of the softer songs, the cuts that feel different than the now overly familiar Foo signature sound. And since those cavernous, accomplished rockers are so towering, they wind up overshadowing everything else on Echoes, which may ultimately be the reason why each Foo Fighters album feels kind of the same: Grohl and his band have grown subtly in other areas, but they haven't pushed the sound that came to define them; they've only recycled it. 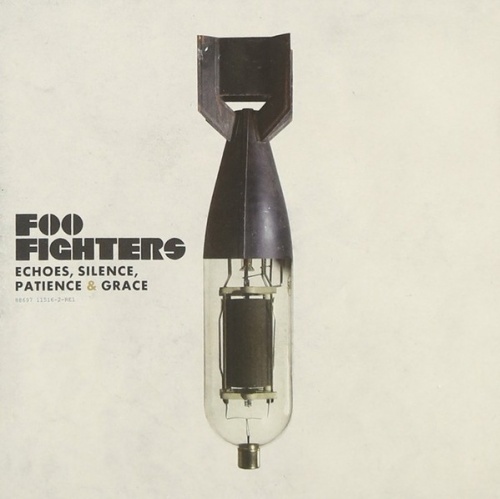 Since this is a sound that's somber, not frivolous, the Foos can sometimes feel like a bit of a chore if they lean too heavily in one direction -- as they do here, where despite the conscious blend of acoustic and electric tunes, the rockers weigh down Echoes more than they should, enough to make this seem like just another Foo Fighters album instead of the consolidation of strengths that it was intended to be.